Welcome to the new c-Bridge administered by Jason, KC5HWB, and the Ham Radio 2.0 Video Podcast. This c-Bridge will be offering connectivity to the core DMR-MARC, DCI and Brandmeister networks along with connectivity to other content (TG) providers. Find ALL DMR information for the State of Texas at www.DMRTexas.net. We share lists of repeaters with TS/TG assignments, locations, codeplugs, CPS, etc. Join us on the Texas Statewide DMR Net every Wednesday evening at 7:30pm CST. It costs about $60 per Repeater license, plus annual hosting fees, to run the C-Bridge. Roughly $700 was spent to get this system up and running with 5 repeater licenses and the first year of hosting. If you'd like to support this system and see it grow, please consider donating any amount you wish via the button below. 2 Local or Metro Sometimes used a "repeater-only" talkgroup. In metroplex areas, TG2 can be used to link repeaters together for a local-area "metro" talkgroup. 3 North America All repeaters connected via C-Bridges in the USA and Canada. Typically English Only. 9 Local Typically used for "repeater-only" traffic, not passed over the C-Bridge. 13 Worldwide English All repeaters connected via C-Bridges worldwide, English only. 113 & 123 UA English 1/2 User Activated (UA) talkgroups UA English 1 and UA English 2, are similar to the TAC310 network launched by DCI. UA English 1 uses the talkgroup ID of 113 and UA English 2 uses the talkgroup ID of 123. US English talkgroups are intended for the English language only, but other User Activated talkgroups exist for other languages also. 133, 143, 153 DMRPlus USA (133) DMRPlus UK (143) DMRPlus South Pacific (153) DMRPlus talkgroups connected to the DMR-MARC network, which allows users of the DV4mini to connect to the DMR-MARC network. 310-319 TAC310-TAC319 TAC 310-319 are destination talkgroups. Consider it like an old-fashioned party-line telephone, if you don't pick-up the handset (PTT), you do not hear it, you are not heard nor are you impacted by the conversation and likely more importantly, TAC does not load your IPSC networked timeslot. It is completely passive or benign to your repeater or IPSC network unless or until you hit the pickle (PTT). This approach puts you or your local users in complete control of your local repeater's timeslot. TAC310-312 are connected to Brandmeister full time. 1776 USA 1776 The “USA 1776″ (English preferred) Talk Group will be distributed worldwide to DMR networks upon request. The spirit of "1776" is to continue the Amateur Radio tradition of international friendship and to push the boundaries of technology in the new frontier of digital communications. USA 1776 is intended to be a flexible, politically neutral, unrestricted Talk Group that can be used as Push-To-Talk (PTT) or Full-Time (FT) to meet the operating requirements of a DMR Network. DMR subscribers are welcome to use 1776 as a universal meeting place to "Rag Chew" or as a jumping off point and QSY to an alternative Talk Group if desired. 3100 DCI Bridge / Brandmeister USA The "Bridge" talkgroup was the first TG created by DCI/TRBO-6 on June 12, 2012 in an effort to bring all the c-Bridges onto a single talkgroup in the very early days of the c-Bridge. It is to be considered a general "ragchew talkgroup" if anyone has an interest in it's current intended purpose. The Bridge has evolved into a worldwide talkgroup since it's cross connection to the Brandmeister platform when once it was restricted to the North American continent only by c-Bridge convention and based on its GSM country code of 310. A Brandmeister connection was added on February 19, 2016 and is full time via DMRX and Brandmeister server 3102. The Bridge talkgroup has has been an under utilized talkgroup in past few years due to the many new c-Bridges and many more talkgroups created since 2012. The bridging efforts in the past year personified by Brandmeister currently, enable P-25, DSTAR, Fusion and DMR to be cross confectioned digitally. While still very early in the BM efforts, the promise is great and DCI feels that a long time, under utilized c-Bridge talkgroup brought together, benefits both the established c-Bridge community as well as the growing Brandmeister community. 31488 Texas Nexus Link Brandmeister DMR Talkgroup linked to the Texas Nexus YSF WIRES-x Room for Repeaters from DFW down I35 to San Antonio, then over to Houston. 314877 Tom Green County Talkgroup for the Metro Area repeaters in Tom Green County, Texas. 314891 Bell County Talkgroup for the Metro Area repeaters in Bell County, Texas. 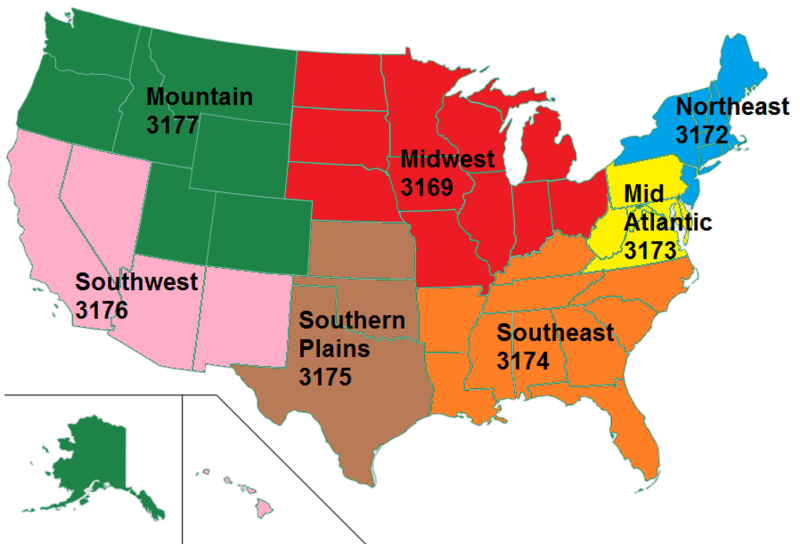 3169 Midwest Regional DMR-MARC Talkgroup for the Midwest States in the USA. See Map at the bottom of this page. These Regional Talkgroups are now inter-connected to the DMRPlus Network. Read more here for details and connection options. 3172 Northeast Regional DMR-MARC Talkgroup for the Northeast States in the USA. See Map at the bottom of this page. These Regional Talkgroups are now inter-connected to the DMRPlus Network. Read more here for details and connection options. 3173 Mid-Atlantic Regional DMR-MARC Talkgroup for the Mid-Atlantic States in the USA. See Map at the bottom of this page. These Regional Talkgroups are now inter-connected to the DMRPlus Network. Read more here for details and connection options. 3174 Southeast Regional DMR-MARC Talkgroup for the Southeast States in the USA. See Map at the bottom of this page. These Regional Talkgroups are now inter-connected to the DMRPlus Network. Read more here for details and connection options. 3175 Southern Plains Regional DMR-MARC Talkgroup for the Texas/Oklahoma/Kansas. See Map at the bottom of this page. These Regional Talkgroups are now inter-connected to the DMRPlus Network. Read more here for details and connection options. 3176 Southwest Regional DMR-MARC Talkgroup for the Southwest States in the USA. See Map at the bottom of this page. These Regional Talkgroups are now inter-connected to the DMRPlus Network. Read more here for details and connection options. 3177 Mountain Regional DMR-MARC Talkgroup for the Mountain Region States in the USA. See Map at the bottom of this page. These Regional Talkgroups are now inter-connected to the DMRPlus Network. Read more here for details and connection options. 31175 North Texas Astronomy Net Talkgroup for NTX Astronomy Net, connected to Brandmeister. 31648 Brandmeister Facebook Group A new group created on Brandmeister for the former users of BM3148, which is connected to the Facebook Group of the same name. This should allow BM3148 to be reserved for Texas users, as originally intended.